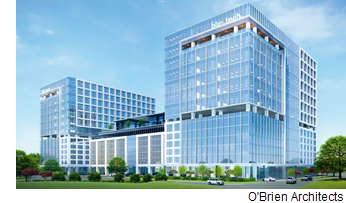 ​​ DALLAS – Developer Heady Investments has broken ground on the first phase of its three-building Headquarters II project at the Dallas North Tollway and Headquarters Dr. The five-acre development will include two 14-story office towers, parking garages, and a high-rise hotel. The development will have 440,000 sf of office space in two phases and will hit the market in early 2020. The offices and an amenity floor will sit on top of six levels of parking. The Headquarters II development is between the $3 billion Legacy West development and Granite Park, just south of SH 121.